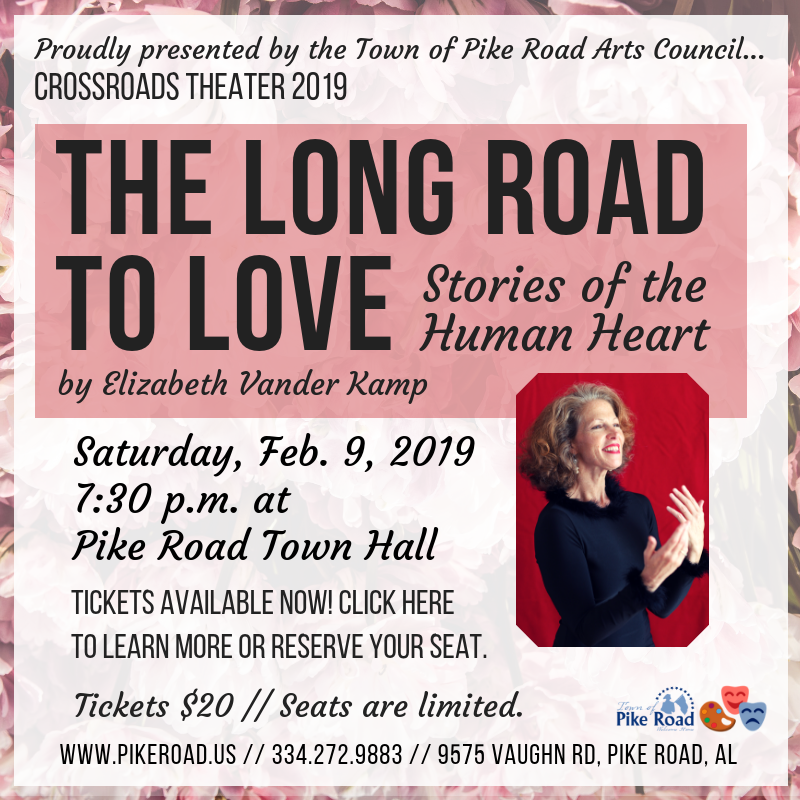 PIKE ROAD, Ala – On Saturday, February 9, Pike Road Town Hall (9575 Vaughn Road) will transform into Crossroads Theater, an annual production of the Pike Road Arts Council. This year, storyteller Elizabeth Vander Kamp will perform “The Long Road to Love…Stories of the Human Heart,” the honest, dramatic account of one couple’s journey of discovery. In the setting of a theatre company, two people meet, and it is love at first sight. A prior engagement and an on-stage love story create suspense that carries you through the years of their entangled lives…How will this story end? Join us Feb. 9 to find out! The show will begin at 7:30 p.m. on Saturday, Feb. 9 in the Mezzanine of Town Hall. Tickets are $20 each and can be purchased by clicking here. bring her words to life. Crossroads Theater provides entertainment to the Town of Pike Road and surrounding communities in the intimate atmosphere of a small-town theater. This annual event, presented by the Pike Road Arts Council, provides a unique dramatic experience each year. Past performances have transported the audience to a different time in Alabama history. In 2018, Ninette Grifith’s “In Her Own Fashion” featured the Birmingham area in the 1950’s and 60’s, and the 2017 installment, “A Sweet Strangeness Thrills My Heart,” dated back to the 1800s. Crossroads Theater is just one of many events presented by the Arts Council year-round. Additional upcoming events include the Mar. 2 Art Market, which will feature local artisans from 9 a.m. – 4 p.m. at Pike Road Town Hall. The Pike Road Arts Council was formed in early 2012 as part of the ENHANCE Initiative. ENHANCE: A Vision with Focus is a detailed plan for accomplishing work in four key areas known as the town’s Four Pillars: quality of life, planning, services and education. ENHANCE stresses the enrichment of quality of life, and includes organizations and projects related to exercise, nutrition, health, agriculture, nature and community education.